Record your favorite vintages, pairings, and more in this handmade journal. 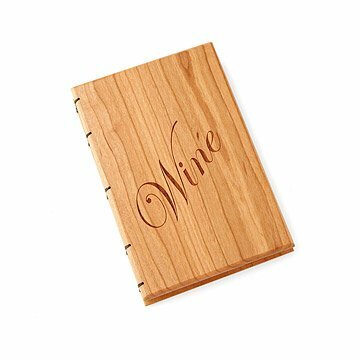 Paste labels of your favorite vintages or jot reviews of the tastiest wine and cheese pairings on the pages of this handsome Appalachian hardwood cherry notebook. Bound with linen threads, the archival paper pages lay flat to easily display your gatherings from the latest dinner party or vineyard visit. Maker Matt Thomas creates beautiful Coptic bound books you'll want to keep in your family for generations. Handmade in West Virginia. Growing up as the son of a Union Carpenter in NYC, Matt was introduced to construction and woodworking at an early age. He has fond memories of "playing" in the wood shop as a small boy, building wooden toys and helping with home improvement projects. To start his working career, Matt started a general contracting firm specializing in built-in furniture and cabinetry. But that career ended abruptly in 2011 when he broke his back and lost his ability to provide for his family. Once Matt regained his mobility, he was able to rebuild his business seemingly overnight. With the support of state tourism agencies, he introduced a new line of handmade wooden designs in 2012. They garnered immediate media attention and filled the production schedule up to a year in advance. Now working from his home studio, Matt is able to spend more time with his lovely wife and four kiddos, who in turn crave time in the wood shop. The wood finish is maintenance free. Avoid exposing paper to dampness. This journal is beautiful and well made, perfect for anyone who wants to record information about their favorite wines. We bought this for our best friends who keep track of all their wine purchases. This beautiful journal is the perfect gift. We're sure they will love it!